Residents from almost half of the Kingsford Homes development gathered in their community on July 14 to learn how to purchase homes they are currently renting from Homeport. The 33 homes in Kingsford were built with funds requiring them to be rented for 15 years. The individuals living in them are now eligible to purchase them. Four families have chosen to buy their homes in Kingsford, a West Side development off Sullivant Avenue. Besides Kingsford, other Homeport communities with single family homes for purchase are Framingham Homes, Greater Linden Homes, Joyce Homes and Southeast Columbus Homes. Residents of Mariemont Homes, Southside Homes and Fairview Homes will be eligible to purchase their homes in 2019. To learn more about the lease-purchase program click here or e-mail brenda.moncrief@homeportohio.org. Refreshments, hot dogs and chips were served to the residents of Kingsford. Each participating family received a $25 gift card to Kroger for gas or food use. A similar party and educational opportunity will be held in the near future for residents of Southeast Columbus Homes and Southside Homes. Homeport's Maggie Wilson, right, in Trabue Crossing Community Room. Nothing like a little hot weather to bring out creativity. With temperatures of more than 90 the first four days of July, Homeport Service Coordinator Maggie Wilson decided July 5 would be perfect to meet residents of Trabue Crossing by hosting an ice cream social. "I love ice cream and thought it would be something fun for the kiddos," Wilson said. "We had 15 adults sign in, but we didn't have a spot to put how many children they brought with them. If I were to guess, I'd say there was at least 50 people, in and out, during the two hours. We ate a total of five gallons of ice cream!" Tayvin Head, Pheasant Run Apartments resident. For the 12th year in a row residents of Homeport communities have benefitted from flowers and plants donated from the national horticulture trade show held in Downtown Columbus. Exhibitors from July 14-17 AmericanHort’s Cultivate’18 returned to all 50 states. By July 18, residents of Bending Brook, Eastway Village, Elim Manor, Fieldstone Court, Framingham Village, Indian Mound, Kimberly Meadows, Parkmead, Pheasant Run, Raspberry Glen, Renaissance Village and Trabue Crossing possessed colorful leftovers. Homeport property manager Wallick Communities picked up the flowers and plants at the Greater Columbus Convention Center, delivering them in 5 U-Haul trucks, according to Brenda Moncrief of Homeport. The flowers will be primarily used to refresh the communities flower beds and dress up residents' homes. Homeport Vice President of Neighborhood Strategy Leah Evans, left, and Homeport President & CEO Bruce Luecke, right, accepted a plaque of thanks from Milo-Grogan Area Commission Chair Charles Thompkins. Homeport participated in the annual Columbus Realtors Realtor Care Day. The Realtor Care Day program was heavily focused this year on the Milo-Grogan community Homeport where Homeport has recently completed 33 new homes as part of a revitalization of the once vibrant working class community north of Downtown. 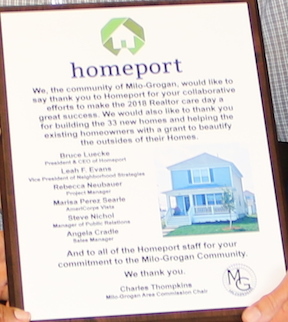 Homeport is also working with individuals in need of repairing their homes or businesses in Milo-Grogan. To recognize Homeport's commitment to the area, Milo-Grogan Area Commission Chair Charles Thompkins made a personal stop to Homeport's headquarters to present a plaque of thanks. Homeport Board Chair Chris Hune, left, and Homeport Senior Vice President for Resource Development Maude Hill. Homeport Board Chair Chris Hune and Homeport Senior Vice President Maude Hill, center, were among 300 participants at the 17th annual Seeds for Growth program held July 26 at the Columbus Metropolitan Library main library in Downtown Columbus. Sponsored by Huntington National Bank, #SeedsforGrowth is designed as a community workshop for non-profit organizations. Former OSU and NBA star Lawrence Funderburke, a financial planner, philanthropist and author, was the keynote speaker, drawing on highlights from his latest book, Sociopsychononomics: How Social Classes Think, Act, and Behave Financially in the Twenty-First Century.